If you like taking pictures, consider building a career in one of the many different kinds of photography and photojournalism markets. It isn't hard to turn your visual imaging skills into a long-lasting and often lucrative job opportunity. Due to the explosion of personal imaging devices in recent years, the demand for visual media is on the rise. In addition to newspaper, magazine and art photography demands, our media saturated world is reaching out for photographs in both unusual and traditional journalism venues. If you have your own photography equipment or are considering adding to your camera collection, you could make a living by turning an exciting hobby into a full-fledged career. Photojournalism: The main function of a photojournalist is to tell a story by way of images. The industry-accepted qualities that separate photojournalism from other areas of photography are: timeliness (in the context of recording recent events), objectivity (dedication to providing an accurate and fair representation) and narrative (combined with other news elements, the images make the story culturally relatable). Amateurs can enter this field, but the professional contingent is tough competition. Advertising Photography: The value images add to advertising means there will always be a need for photographers specialized in this field. A successful advertising photographer excels in several different kinds of photography such as macro, portraiture, glamour, and travel. In most cases, a degree in photography or fashion photojournalism gives the candidate a better chance to build a career. Wedding Photography: One of the most enduring markets, wedding photography offers even amateurs an opportunity for success. Like the advertising niche, wedding photography requires skill in more than one area. Knowing how to use photo editing software to achieve special effects can also add a boost to a wedding photography career. Underwater Photography: The exclusive skills needed to capture images underwater places this form of photography in the niche category despite the fact that it's been around for decades. Many successful underwater photographers started out as amateur shutterbugs with excellent diving skills. 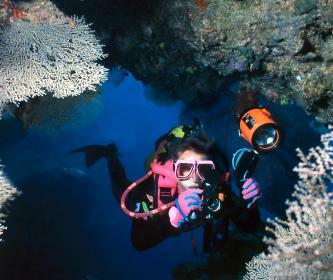 A unique combination of photography talent and diving experience is crucial to advancing in this field. Food Photography: Cookbooks feature a plethora of images of yummy confections or savory dishes captured not by the chef, but by a dedicated food photographer. As the public interest in cooking grows, so does the need for photographers to create pictures of food that looks good enough to cause salivation. A good way to gain a foothold is to start a food blog and post images of restaurant dishes, Granny's roast turkey or your very own chicken noodle soup. Pet Photography: Not everyone can handle other people's pets, but if you have a wealth of patience and a love of animals, then pet photography might be your thing. People love their animals nearly as much as their children and pay well to have pictures taken of their beloved pet. Flexibility is important since you might find yourself snapping photos of lizards, rats, snakes, or even spiders. The opportunities to make money from your photography skills are nearly endless. Even if you currently take photos just for fun, there's no telling where your talent could lead you in the future.